1967 was a year when the sport of rallying was undergoing a change. The rallies were continuing their transformation from regularity-style events to making timed special stages the deciding factor and there was a new contender challenging the establishment. It was in 1967 that the new Porsche 911 really took the fight to the incredibly successful BMC Mini Coopers. Between them, these two teams won more than half of the events making up the European Rally Championship, but the rally results were still diverse with eleven different drivers and eight different car brands including Lancia, Ford, Renault, Saab and Wartburg scoring overall victories. Now McKlein has produced the first-ever annual to cover this interesting rally season. Each of the sixteen rounds that were held is covered with photographs from the McKlein archive and text from John Davenport who both competed in and reported on these events. In addition, there are reports and statistics on the yearÃ†s major non-championship international rallies, some of which were founder members of the World Rally Championship when it was created in 1973. Plus there is coverage of the Ã´Rally That Never WasÃ¶, the cancelled RAC Rally of 1967. 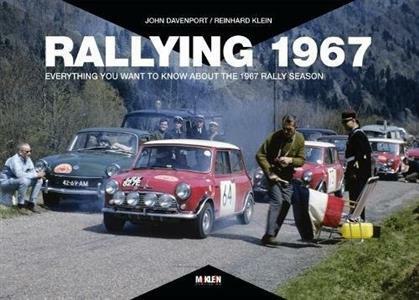 With 378 pages of photographs, texts, statistics and memorabilia from the rallies of 1967, this annual which is being produced in a very limited quantity will transport you back to an exciting period when rallying rapidly started to increase in stature.